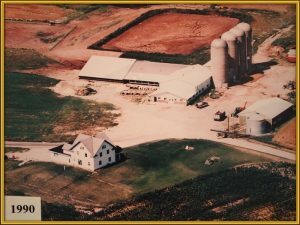 Each year Kewaunee County Breakfast on the Farm is hosted by a different family farm – learn more about our 2016 host farm’s history! 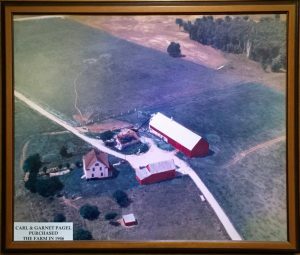 John grew up on the Pagel Family’s homestead farm purchased by his parents, Carl and Garnet, in 1946—80 acres, 8 cows, 6 pigs and a few chicken. Their 7 children, John being the youngest, were always involved in the farm work. Adopting the typical Wisconsin farm-family work ethic necessary to support their growing family, the farmstead’s land and animals that provided their livelihood. 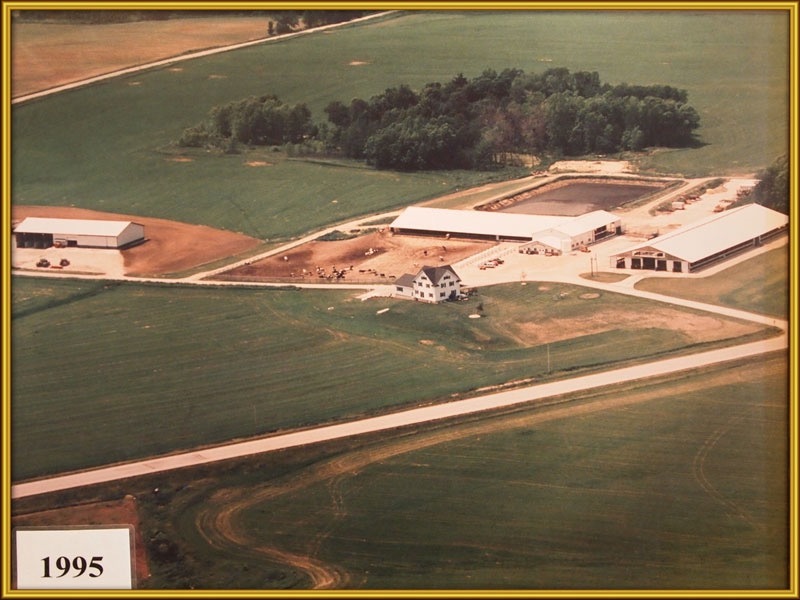 With their progressive dairy practices Carl gradually expanded the dairy to 380 acres and 65 milking cows before his retirement in 1980. John purchased the Ponderosa Dairy from his parents in 1980, after attending the U.W.-Madison Farm Short Course Program where he was prepared to be a progressive dairy business man as well as a steward of their land and its environment. In 1985 the Ponderosa Dairy experienced a devastating barn fire, losing 48 cows and heifers plus the farmstead’s iconic red barn that had sheltered their dairy herd for 40 years. John rebuilt a larger, efficient “free-stall’ barn to hold 100 cows and a modern milking parlor. In 2008 John’s family met—Jamie, John Jr., Bryan, Dustin and their spouses—and decided to work together to expand the Ponderosa Dairy business. Each member agreed to specialize in a segment of the farmstead’s management, production and maintenance, ensuring that their Wisconsin dairy remains a leader in progressive and responsible dairy farming in Wisconsin. In 2013 John added another new barn, specifically to house dry cows and a new maternity ward to complete Pagel’s Ponderosa Dairy LLC on their homestead property, plus 3,000 calves and heifers on their Ponderosa Calf Ranch. In addition there are 2,300 heifers at Pagel’s Coleman Ponderosa. Pagel’s Ponderosa Dairy hosts more than 7,000 visitors annually who come to their farm to learn about modern, progressive dairying. John’s dream has always been to show consumers about where milk comes from, and to create and market products on the Pagel homestead. In 2014 John purchased Ron’s Wisconsin Cheese and in 2015 opened The Cannery Public Market in downtown Green Bay. 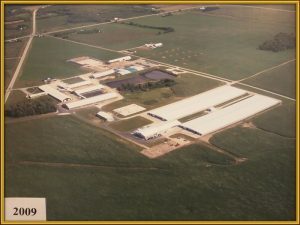 Like John has always said, “From The Cow To The Countertop” which sums up his philosophy on just how fresh beef and dairy must be to truly own the title “farm-to-table.” Who knows what the future holds for the Pagel family but one thing is for sure, it will be done with the same passion as in years past. Come make memories with us this Father’s Day (6/19/2016), sign up to volunteer at Kewaunee County Breakfast on the Farm – enjoy a delicious dairy brunch, then see cows being milked and cheese being made at Pagels Ponderosa Dairy!